In an interview this week with the Australian media, Jordan’s King Abdullah became the latest Arab leader to express hope that President-elect Donald Trump and his team will lead the world’s to date failed fight against jihadist Islam. Like his counterparts in Egypt and Saudi Arabia, Abdullah effectively ruled out the possibility that President Barack Obama will take any constructive steps to defeat the forces of global jihad in his last months in power. Egyptian President Abdel Fatah a-Sisi was among the first Arab leaders to welcome Trump’s victory. Sisi has been largely shunned by the Obama administration. President Barack Obama supported the Muslim Brotherhood regime that Sisi and the Egyptian military overthrew in 2013. The support that the incoming Trump administration is garnering in the Arab world stands in stark contrast to the near wall-to-wall opposition to Trump expressed by the American Muslim community. According to a survey of Muslim-American opinion taken in October by the Council for American Islamic Relations, (CAIR), 72 percent of American Muslims supported Democratic nominee Hillary Clinton. Trump was supported by a mere 4 percent of the Muslim community. Muslim-American activists played key roles in the Clinton campaign. They were particularly active in swing states like Ohio and Michigan where Trump won by narrow margins. As the Jerusalem Post reported Wednesday, since the election, Muslim-American leaders have expressed concern and hostility towards the incoming Trump administration. Muslim Democrat activist James Zogby, who also heads the Arab American Institute, published an op-ed in the Jordan Times to this effect after the election. Zogby expressed concern that the Trump administration would harm the civil rights of Arab Americans. The gap between the Arab world’s support for Trump and the Muslim-American community’s opposition to him is particularly notable because it reverberates strongly the growing cleavage between the Israeli government and public and large swathes of the American Jewish community. Led most prominently by the Anti-Defamation League and its executive director Jonathan Greenblatt, in the wake of the election, American Jews are at the forefront of efforts to delegitimize Trump and his senior advisors. Unlike their Muslim-American counterparts, who are keeping their criticism of Arab regimes to themselves, Greenblatt, the ADL, and their allies on the Left have linked their opposition to Trump to legitimizing opponents of Israel. Before assuming his role at the ADL, Greenblatt worked in Valerie Jarrett’s political influence shop in the Obama White House. As ADL chief, Greenblatt has used his position as the head of a major Jewish organization to support the Obama administration’s policies. To this end, since the election, the ADL has worked to tar the incoming Trump administration as anti-Semitic, focusing its fire on Trump’s senior strategist, former Breitbart News CEO Stephen Bannon. The ADL spearheaded the campaign to label Bannon an anti-Semite. When its claims were shown to be entirely spurious, this week the ADL quietly acknowledged that Bannon has actually never made any anti-Semitic statements. But its quiet admission of spreading lies didn’t stop the ADL from continuing to traffic in them. Even after it admitted that “We are not aware of any anti-Semitic statements from Bannon,” the ADL continued to insist that Breitbart has been a home for anti-Semites because some Jew haters wrote anti-Semitic responses to Breitbart articles. The ADL’s smear campaign against Bannon is a hard sell because Breitbart is among the most pro-Israel websites in the US. But this brings us to the second aspect of the ADL-led campaign against President-elect Donald Trump and his team. With each passing day, it becomes increasingly clear that the ADL and its allies are using the Trump victory as a means to draw a distinction between pro-Israel and Jew-friendly while arguing that anti-Semites support Israel and that people who hate Israel are not anti-Semites. This was the clear goal at the ADL’s summit on anti-Semitism last week. As Daniel Greenfield reported Thursday in Frontpage Magazine, ADL used the conference to legitimize the so-called BDS campaign to boycott Jewish Israeli products and divest from businesses that do business with Jewish owned Israeli businesses. It similarly normalized the general argument that there is nothing inherently anti-Semitic about opposing the Jewish state. In a panel with the disturbing title, “Is Delegitimization of Israel Anti-Semitism?” the ADL featured anti-Israel activist Jill Jacobs and the Jane Eisen. Both women argued that BDS is legitimate. At the same time, they denounced fervent supporters of Israel like Bannon and Center for Security President Frank Gaffney. 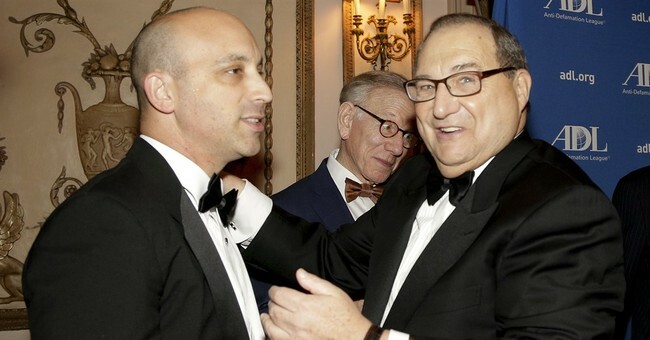 Greenfield reported that the ADL gave a prominent platform at the conference supposedly dedicated to fighting anti-Semitism to Ford Foundation CEO Darren Walker. The Ford Foundation is one of the leading contributors to anti-Israel organizations in the US and to anti-Zionist political front groups in Israel. Other speakers explained that it isn’t that Israel’s foes are anti-Semitic. It is just that Israelis and their supporters have become “hypersensitive” to criticism. A few days after the conference, the ADL took the next step towards normalizing hatred for Israel in America when it announced its support for Rep. Keith Ellison’s candidacy to serve as the next chairman of the Democratic National Committee. Ellison became the first Muslim American elected to the House of Representatives in 2006. In the decades that preceded his election, Ellison built a long and documented history of membership in and advocacy and employment for the anti-Semitic Nation of Islam. In his capacity as a Nation of Islam spokesman, Ellison made anti-Semitic statements and promoted anti-Jewish and anti-Israel positions and activists. Since joining the House of Representatives, Ellison has been one of the leading anti-Israel voices in Congress. He has spearheaded multiple anti-Israel initiatives. He openly supports the boycott of Israeli Jewish products and has castigated Israel as an apartheid state. Together with James Zogby, last August Ellison served as a member of the Democratic Party’s platform committee. The men attempted to purge the platform of language in support of Israel. ADL is supporting Ellison – and opposing Trump and his pro-Israel advisors – because Greenblatt and his backers support Obama’s policies in the Middle East and want to make it difficult for Trump to abandon them. Ellison and the leading American Muslim groups oppose Trump for the same reason. The difference between the two groups is that the ADL and its Jewish backers are acting in this manner because they support the Left, which Obama leads. Ellison and his allies at CAIR, the Islamic Society of North America, and the Arab American Institute and other groups oppose Trump because they support the substance of Obama’s policies. The chief characteristics of Obama’s Middle East policies have been support for the Muslim Brotherhood and Iran against Israel and the US’s Sunni allies. Former FBI agent and counterterrorism expert John Guandolo estimates that upwards of 80 percent of Islamic centers and mosques in the US are controlled by the Muslim Brotherhood. The major American Muslim groups, including CAIR, ISNA and the Islamic Circle of North America are tied to the Muslim Brotherhood. The Muslim Brotherhood in turn supports Iran. During his year in power in Egypt, the Muslim Brotherhood’s Muhammad Morsi permitted Iranian warships to travel through the Suez Canal, hosted Iranian leaders and Hezbollah commanders in Cairo and took a series of additional steps to embrace Iran. Trump’s foreign policy advisor Walid Phares gave an interview to Egyptian television after Trump’s election stating that Trump will support a bill introduced by Senator Ted Cruz to outlaw the Muslim Brotherhood in the US as well as its offshoots CAIR, ISNA and others due to their support for jihadist terror groups formed by Brotherhood members. Al Qaeda, Hamas and a host of other jihadist groups have all been formed by Muslim Brotherhood followers. Trump’s National Security Advisor, Lt. Gen. Mike Flynn, Rep. Mike Pompeo, whom Trump has selected to serve as his CIA Director as well as Marine Gen. James Mattis, the leading contender to serve as Trump’s Defense Secretary are all outspoken opponents of Obama’ nuclear deal with Iran. Given the stakes then, it makes perfect sense that the Arab American groups oppose Trump. It also makes sense that Arab regimes threatened by the Muslim Brotherhood and Iran support Trump and eagerly await his inauguration. And it clearly makes sense for Israel to welcome Trump’s election. The only thing that makes no sense is the American Jewish campaign to demonize Trump. The ADL’s leadership of the campaign to smear Trump and his advisors while legitimizing BDS and supporting Israel bashers is antithetical to the interests of the American Jewish community. In adopting these positions, Greenblatt and the ADL along with their allies in J Street, Jewish Voices for Peace, If Not Now, the Forward, other far left groups and mainstream groups that have lost their way show through their actions that they have conflated their Judaism with their support for the Left. To the extent that the interests of the Jews of America contradict the positions of the Left, the Jews of America are behaving in an “anti-Semitic” way. It is the responsibility of the segment of the community that understands “Jewish” is not a synonym of “leftist” to oppose the ADL and its backers. If they fail to do so, they will contribute to the descent of the community into powerlessness and irrelevance, not only in the era of Trump, but into the future.